Directions One to two tablets per day, or as directed by your health professional. Swallow with water or a cold drink. Not to be chewed. Do not exceed the recommended intake. 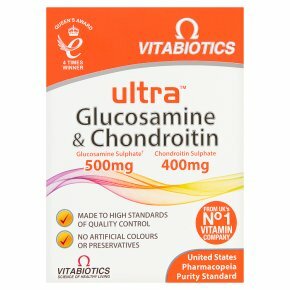 Can be used in conjunction with any other product in the Vitabiotics range except other supplements containing glucosamine. A regular intake is recommended. Ultra Glucosamine & Chondroitin contains glucosamine sourced from natural chitin. Diabetics and those using blood thinning medication (e.g. warfarin), should consult their doctor before using this product. FOOD SUPPLEMENT<br>Food Supplements must not replace a varied and balanced diet and a healthy lifestyle. As with other food supplements, consult your doctor or pharmacist before using if you are under medical supervision, pregnant, breast-feeding, have diabetes, epilepsy, or are taking warfarin or other anti-coagulants (blood thinners), suffer from food allergies, or are allergic to any of the ingredients. Not suitable for children.